Let’s get a few things straight from the word go. 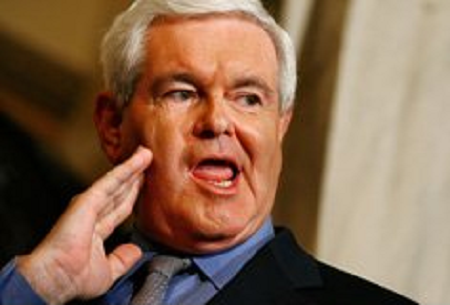 First of all, a guy with a face as ugly as Newt Gingrich has about as much chance of saving America as a turd in a punchbowl. I mean, for God’s sake, that mug of his would curdle milk! But, seriously, do these guys have nothing else in their arsenal of insults but the Nazi card? It seems to me that Newt is muscling in on Glen Beck territory, and Glen might want to consult his lawyers about this outrage. At the risk of being condescending to my learned colleagues here on Amplify (which I do not intend), the saying meant that the kid who was the first one to pinch his nose and go, “Oh my God, what is that awful smell?!?! ?,” was, invariably, the foul culprit polluting the air with his (it was, rarely, her) stench. So, Newt, the next time you want to accuse someone of being a Nazi, Fascist or other anti-liberty sort, you might want to remember “smeller’s the feller,” and save us from your putridity. There is precious little clean air left on this planet, and it’s getting harder and harder to breathe. Gingrich found himself on the defensive during recent sit-down session with a local reporter from the Des Moines Register. The Des Moines Register is about as center-of-America as you can get, and this reporter definitely earned a gold star in my book for not letting the former Speaker off the hook when he tried to distance himself from some of the fiery rhetoric from his book, To Save America: Stopping Obama’s Secular Socialist Machine. This entry was posted in Blowhards Who Should Keep Their Traps Shut and tagged insults, Nazi, newt gingrich, Obama, To Save America. Bookmark the permalink.